Amongst cities in the Veneto, Venice takes center stage. But in nearby Padua, visitors can enjoy important art and architecture without jostling hordes of tourists. 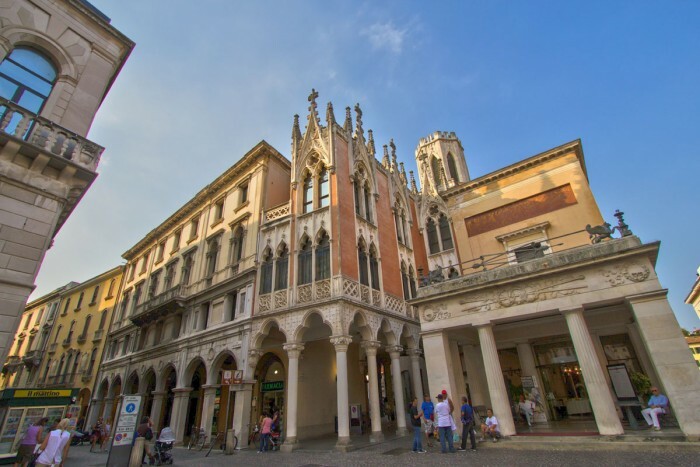 Padua (Padova in Italian) is easily accessible by train from Venice and rich with its own historical splendor. 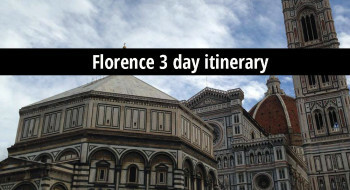 It is home to one of the oldest universities in the world, a traditional open market, canals, churches and endless arcaded streets fit for wandering. Magnificent art aside, one of Padua’s greatest gifts is its authenticity. 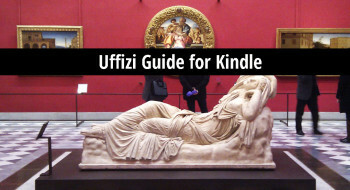 Here you can see locals and daily life mingle with the celebrated works of Renaissance masters. The following are ten good reasons to visit Padua, which you can easily do on foot and public transit. This is Art History 101— the Arena Chapel is a site that any self-respecting book or course on Western Art mentions. 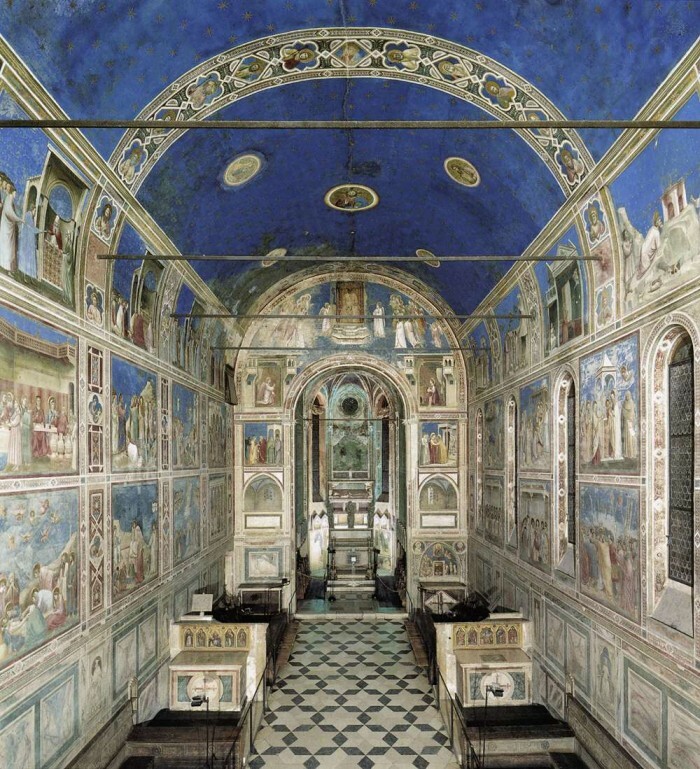 Known in Italian as the Scrovegni Chapel, it’s small and unremarkable from the outside, but its inside houses a renowned fresco cycle by Giotto. The chapel was built by Enrico Scrovegni, a notorious usurer who earned a mention in Dante’s Inferno. Some speculate that Enrico’s son commissioned the fresco decoration as a plea to atone for his father’s sins. The walls depict episodes from the lives of Christ and the Virgin, as well as a rather medieval Last Judgment. 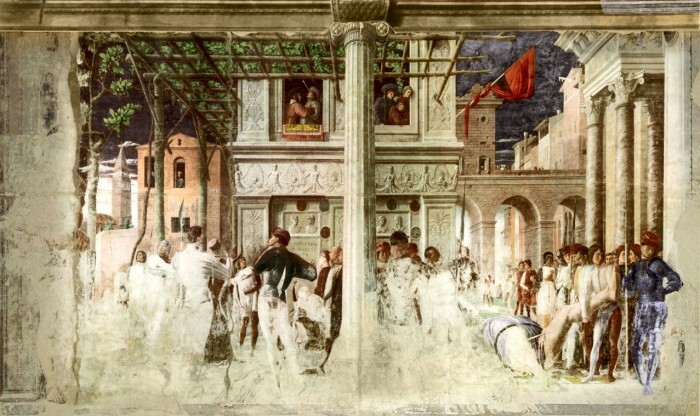 The way narrative and volume are shown in the episodes on the walls are considered early stirrings of the Italian Renaissance (called Proto-Renaissance). 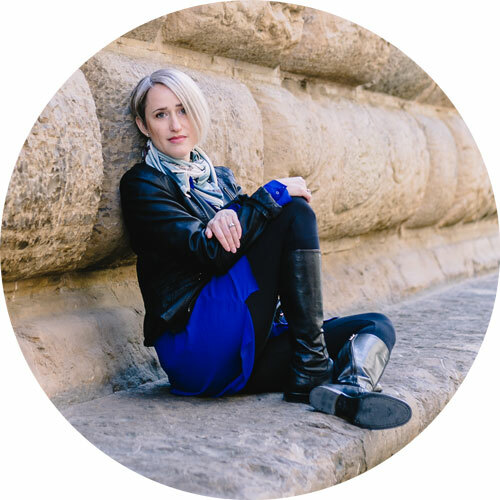 Look for details of striking attention to realism and naturalistic expression. The Slaughter of the Innocents and The Kiss of Judas display a sense of poignant drama that was rare in art from the same period. The frescoes rendered in resplendent colors, and one can only imagine their original glory. Visit the chapel and decide for yourself whether this masterpiece merits a ticket out of hell. Unlike other places in Padua, seeing the Scrovegni Chapel can be a bit of a hassle. In an effort to minimize damage to these fragile works, visitors are limited to fifteen minutes inside, and waits can be lengthy. Plan ahead and absolutely buy advance tickets. Thousands of people visit Padua every year, but not all come to sightsee. 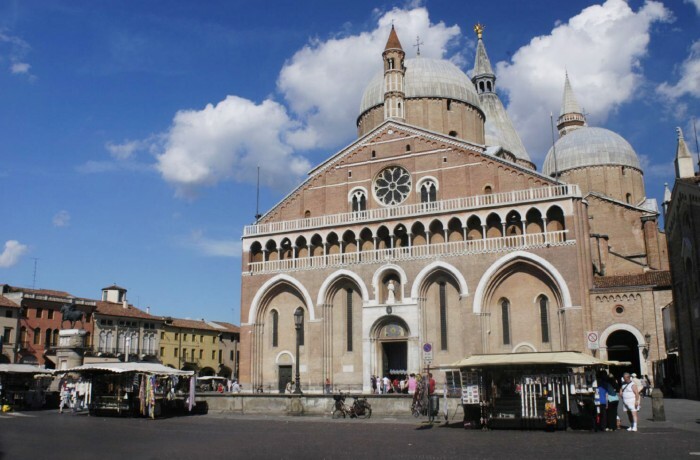 For Roman Catholics around the world, Padua is an important pilgrimage site dedicated to Saint Anthony, who is known for his kindness towards children, the poor and the sick. The Basilica of Saint Anthony is his shrine, recognized by the Vatican and known locally as Il Santo, “The Saint”. In the piazza outside Il Santo, it is fascinating to see pilgrimage alive and well. Plenty of shops and stalls sell figurines, postcards, and other saintly souvenirs. 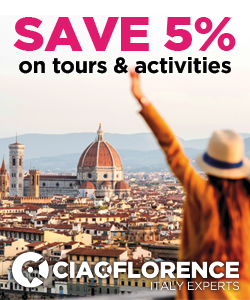 But don’t miss the big horse in the middle… Donatello’s huge equestrian statue for the condottiere Gattamelata is one of the masterpieces of the Italian Renaissance. The Basilica’s interior is a hodgepodge of architectural styles: Romanesque, Gothic, Byzantine, Renaissance and Baroque. The high altar features bronzes by Donatello, including sculptures of various saints, the Virgin and Child, and the miracles of Saint Anthony. The saint’s remains are on display in glittering gold reliquaries. They hold a special significance for Saint Anthony as a “speaking saint”, who gave many sermons during his short life. Accordingly, pilgrims venerate his preserved tongue and jawbone. 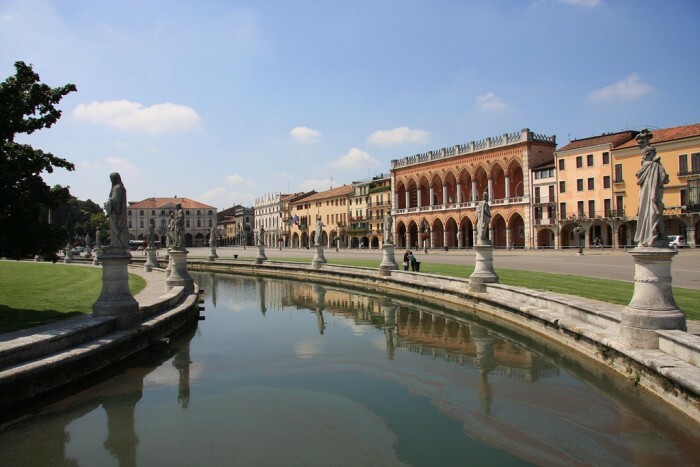 Padua is the location of one of the world’s oldest universities, just slightly younger than the University of Bologna. The institution has produced many notable individuals and accomplishments. Among them are the famed anatomist Vesalius, astronomer Nicolaus Copernicus, and Galileo Galilei. 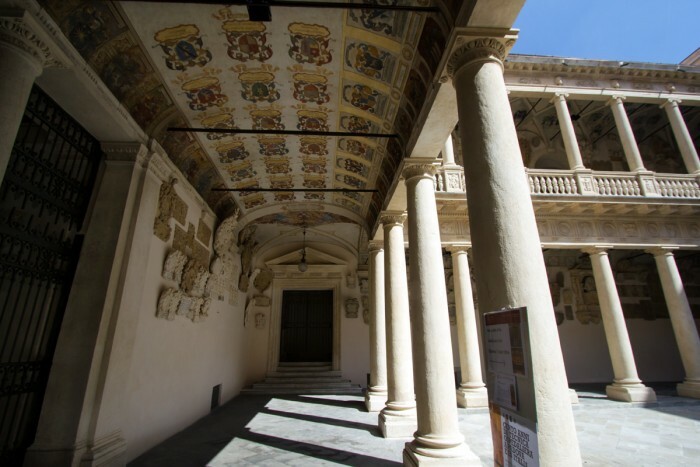 You can visit the university’s historic buildings, most notably the Palazzo Bo. This palace’s inner courtyard and Aula Magna (Great Hall) are covered with family crests, portraits, diplomas and other memorabilia. Look out for paintings of the Lion of Saint Mark—a reminder of Venice’s longstanding dominion over Padua. Inside the palazzo, you can also see the world’s first permanent anatomical theater. The space is claustrophobic and you shudder to think what it must have been like to witness a sixteenth-century dissection on the table at the bottom of its telescoping levels. The builders planned for squeamishness: the wood-paneled railings are extra high to catch students who might faint away during class. Padua has no shortage of wonderful places to grab a cappuccino, but one you should not miss is Café Pedrocchi. Built in the eighteenth century, the ground floor is a stately affair with old-fashioned, formal wait staff. Café Pedrocchi was a hive of activity in the mid-nineteenth century, when the unification of Italy was still a new idea: the three columned rooms reference the newly formed Italy with walls of green, white, and red. The upper-level rooms are nothing less than a rollicking tour through various decorative styles. The architects clearly had a lot of fun designing rooms inspired by Etruscan, Renaissance, Pompeian, Baroque, Gothic and Napoleonic models. My personal favorite is the Egyptian room, though it is somewhat bizarre to see pharaohs and sphinxes looking out onto an Italian piazza. Café Pedrocchi is a little on the pricey side, but it is one of the most historic cafes in Europe so definitely worth at least one visit. 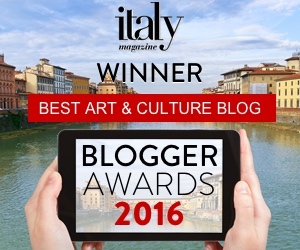 Padua earns another superlative “-issimo” with the Prato della Valle. The largest public square in Italy, Il Prato is a vast elliptical space in the heart of the city. The square is ringed by a moat and decorated with sculptures of notable Paduans. Look for the figure at the very north end of the Prato—that would be Andrea Memmo, a Venetian who restored and funded the project. Today, it stands as an example of Italianate taste for Baroque theatricality. By day, the Prato swirls with traffic, mopeds, bicyclists, and pedestrians. In the grassy expanse at the center, students from the University of Padua lay out to study or sunbathe. When night falls, natives of all ages fill the square to enjoy music, roller-skating, a cup of gelato or a simple passegiata—the stroll after an evening meal. Sometimes the works of art that impact us most strongly are those that have been altered, damaged or obliterated. While other sites like the Scrovegni Chapel narrowly escaped destruction in World War II, the nearby Church of the Eremitani didn’t fare so well. “The Church or the Hermits” as it’s known in English is a thirteenth-century Augustinian structure. Andrea Mantegna was commissioned to cover the interior walls of the Ovetari Chapel with frescoes depicting saints James and Christopher. The finished works were some of Mantegna’s finest, highlighting his use of innovative perspective and adherence to classical models. In its semi-destroyed state we can still imagine the incredible impact of the artist’s obsessive use of perspective. However, the church had the misfortune of being located right next to Padua’s Nazi headquarters, and was hit by Allied bombers. Nearly all of Mantegna’s frescoes were destroyed, save The Assumption and The Martyrdom of Saint Christopher. This is not to say that the remaining works aren’t profoundly beautiful. Nevertheless, you are reminded of the wholesale cultural destruction caused by the Second World War, in Italy and around the world. 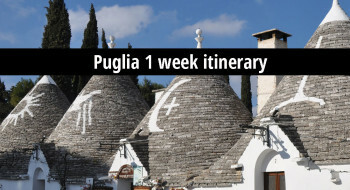 While visiting major cities in Italy, authentic experiences can be hard to find. 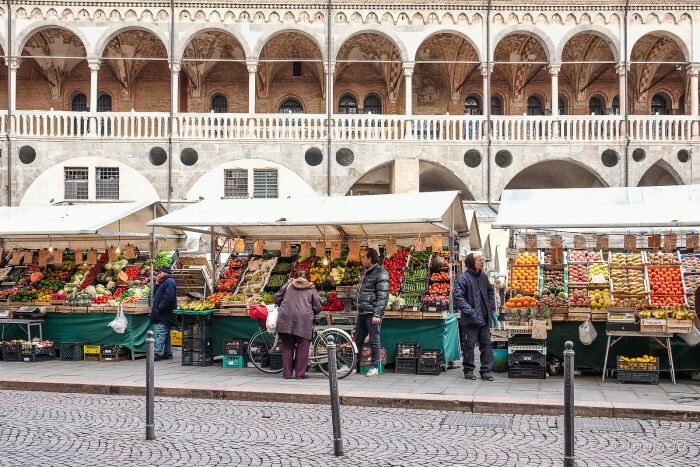 Luckily, Padua has managed to keep many of its traditions alive, especially the daily market trip. If you visit the Piazza delle Frutte and the neighboring Piazza delle Erbe before 2pm, you will have a chance to relive that centuries-old ritual for yourself. These squares in the heart of the city offer a wide range of seasonal fruits, vegetables, herbs and flowers. In between Piazza delle Erbe and Piazza della Frutta is the imposing Palazzo della Ragione. A medieval town hall building, the interior is a vast open space suitable for official events and gatherings. The walls are illustrated with intricate fresco cycles on astrological and religious subjects. Don’t forget to find the “Stone of Shame”, where debtors were forced to sit and endure public humiliation. Beneath the Palazzo della Ragione are numerous covered stalls with butchers, fishmongers, bakeries and cheese shops. These are ideal for cobbling together an inexpensive lunch. For an eclectic glimpse of the Paduan Renaissance, visit the Loggia and Odeo Cornaro, just steps from Il Santo. This complex of buildings was commissioned by Alvise Cornaro, a native son of Padua and a true Renaissance man. Cornaro was a nobleman who also nurtured interests in hydraulic engineering, healthy living, architecture, theatre, poetry and art. He built a loggia in Padua, and borrowed heavily from classical antiquity. The open porch was intended for theatrical performances and spectators once filled the grassy courtyard. The Odeo is a smaller, more intimate space in an octagonal shape. 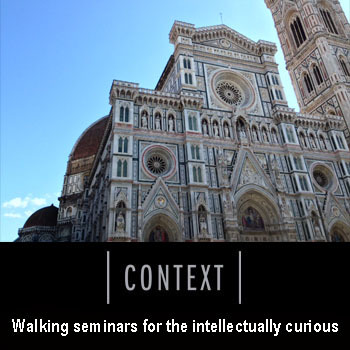 Cornaro dedicated the Odeo to stimulating conversations, poetry and musical performances. The room reminds you of a small cave, and the walls are decorated with bizarre creatures and grotesques. In a city filled with patrician sculpture and religious painting, these comical works are both strange and highly enjoyable. Some believe that the excavation of Emperor Nero’s pleasure dome in Rome inspired Paduan artists to paint these fantastical works in the Odeo. If you spend any time perusing art of the Veneto, you will become familiar with scuole and scolette, also known as confraternities. These were charitable and religious organizations; in the ones made up of elites, members commissioned richly decorated meeting halls. Adjacent to “Il Santo” are the Oratory of Saint George and the Confraternity of Saint Anthony. The Oratory building is also a funeral chapel for the wealthy Lupi family, and continues the heritage of fresco painting in Padua. The barrel-vaulted brick chapel and its interior walls echo the Scrovegni frescoes, though these works were completed by Altichiero da Zevio. Right next door to the Oratory of Saint George is the Scoletta del Santo, or the Confraternity of Saint Anthony. If you are curious about the works of this Franciscan saint, you can view them as sensitively interpreted by Titian – alongside frescoes by his contemporaries. Museums around the world boast examples of Titian’s luminous oil portraits and altarpieces. 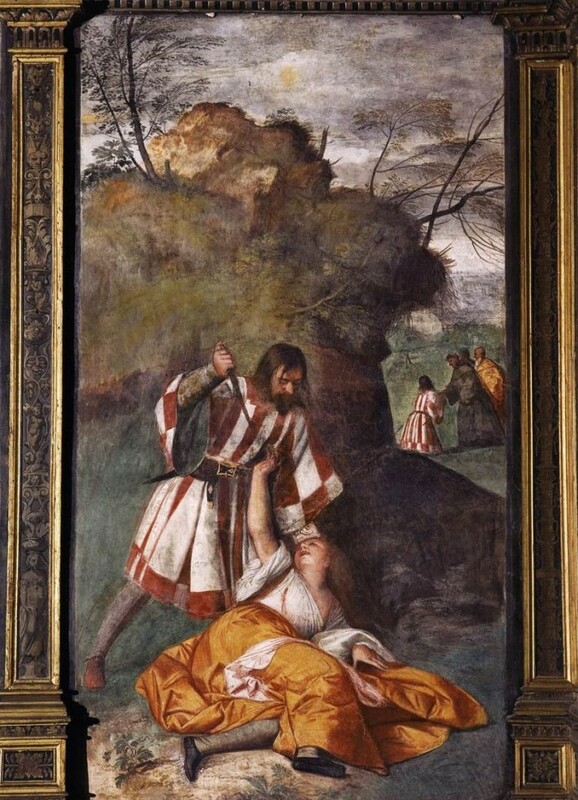 However, the Scoletta del Santo offers a rare glimpse of Titian’s earlier work in the fresco medium. Titian depicts moving episodes from the life of Saint Anthony, including The Miracle of the Newborn Child, The Miracle of the Jealous Husband, and The Miracle of the Wrathful Son. 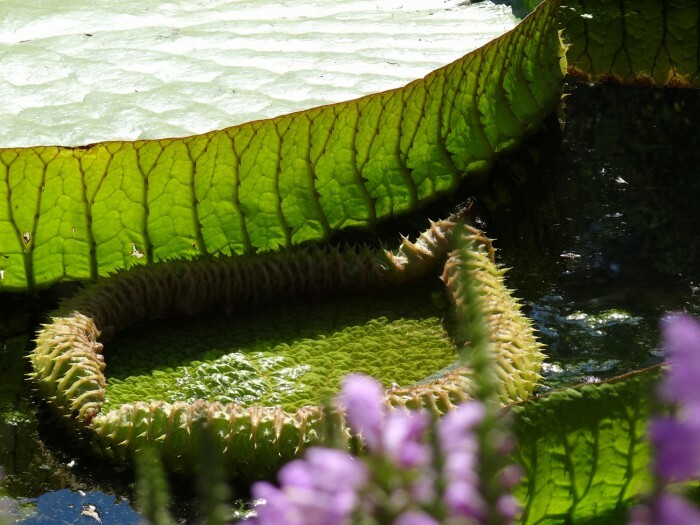 The Orto Botanico, or Botanical Garden is the first of its kind in the world and is recognized as a UNESCO Heritage Site. The garden was established in 1545 and has been in continuous use ever since. With an eye to nature as well as architecture, the garden’s layout is a square within a circle. The circular design ringed by water was meant to reflect contemporary maps of the world. Within its boundaries are over 7,000 plant species, some of which evince the Venetian Empire’s contact with far-flung cultures. Over the years, the university has added enhancements like a library, walls, balustrades and gates. The layout remains true to its original conception—meant to be orderly and pleasing to the eye. But the Orto Botanico is not just another pretty place to see some flowers. Since its founding days, the garden has served as a repository for botanical knowledge, and its intersections with medicine, ecology, conservation and culture. Walking along the orthogonal paths, you gain a real sense of how Renaissance thinkers were striving to understand the natural world in new ways.